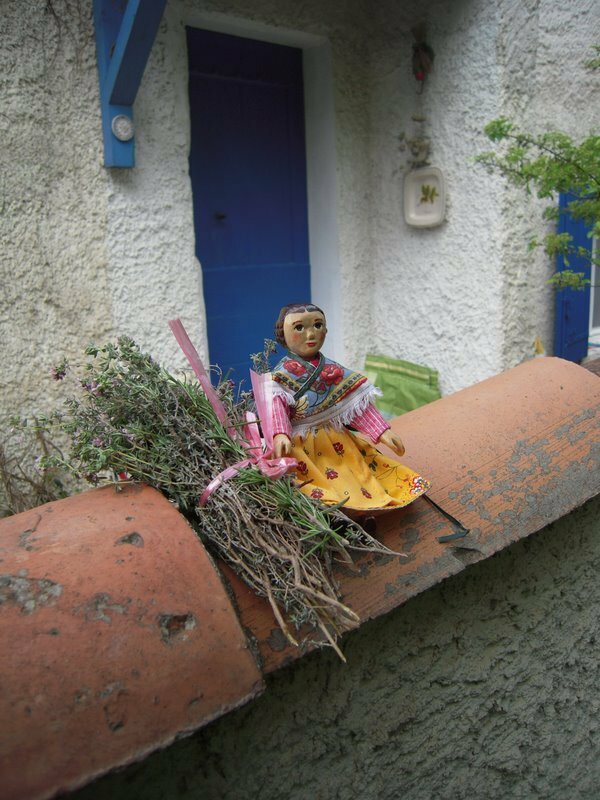 I made Constance some special clothes while I was visiting France a few years ago, using fabrics I bought in Aix-en Provence. She wore her outfit when we went for a stroll on the thyme-scented hillsides near Cabriès. I ended up with the brightly coloured outfit I wanted, but the texture wasn’t perfect. When I got home I made her a lacy linen cap. 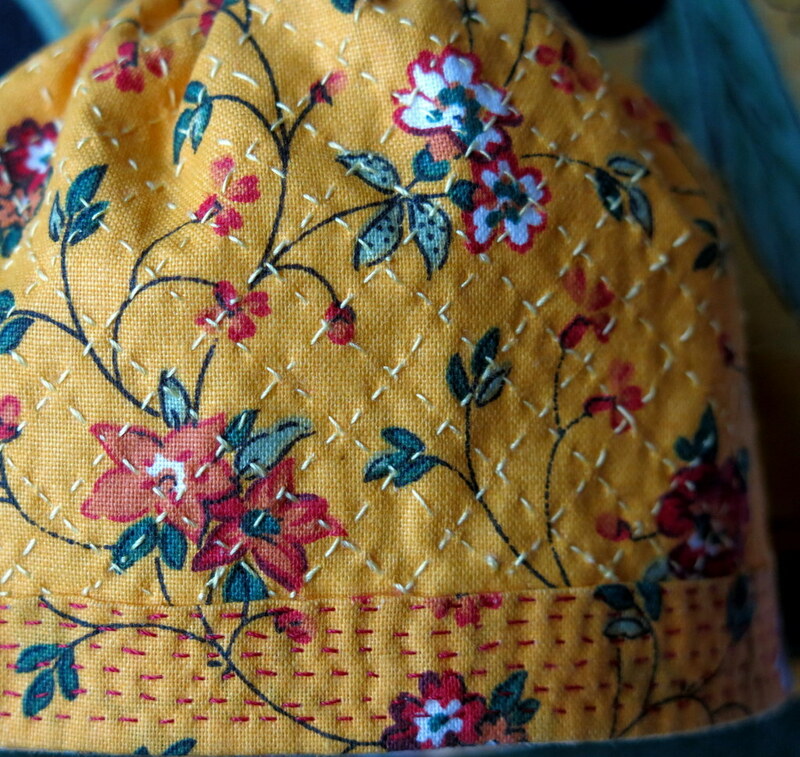 Last weekend, I decided to unpick the waistband and back seam of the skirt, then I pressed it flat, and attached a scalloped hanky as a skirt lining. 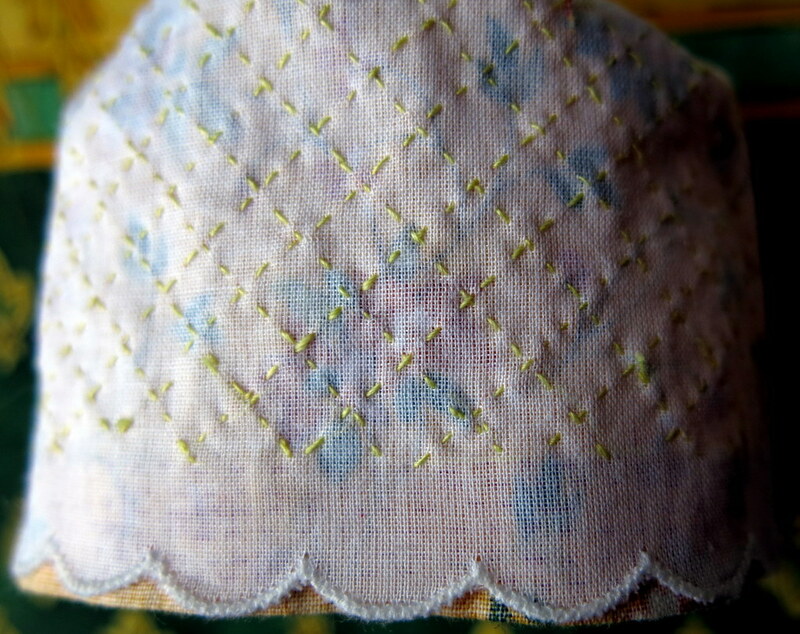 The already quilted hem of the skirt encouraged me to leave the bottom 2 cm of the hanky unstitched – I like the way the scallops give the lining a petticoat effect. 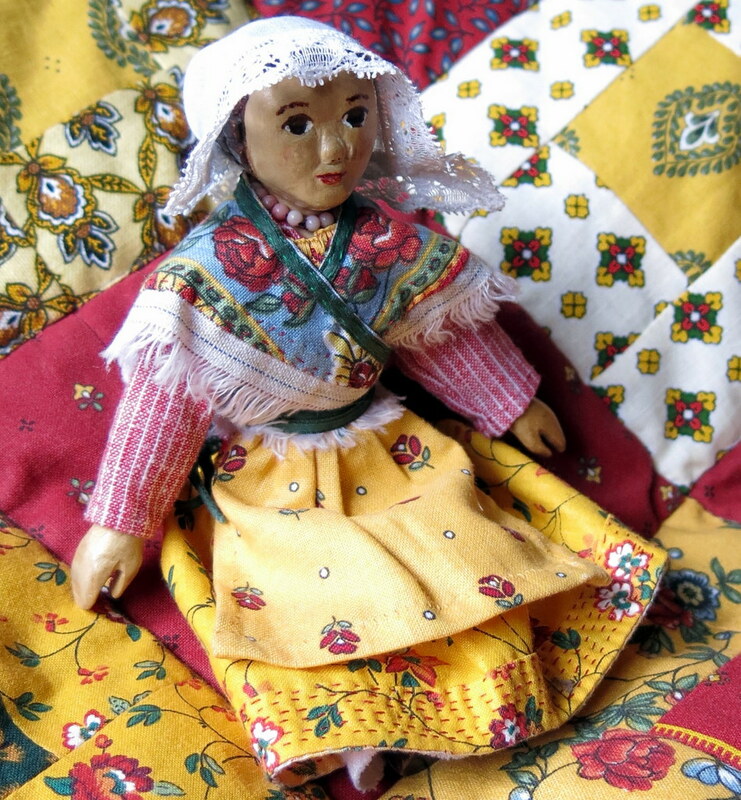 …and Constance agrees that the heavier folds and quilted surface approaches the look of a Provençal girl’s outfit – but she requests that I please make her a nice straw hat to complete the ensemble! Bet Constance is the envy of all those Provence girls!!!! Great job, superb results! Your fingers work magic. Constance and I are glad you think she might blend in…though we do still need to make a straw hat, then maybe we can go and gather lavender and thyme on those hills again! Maybe, someday, you could show us all your collection; it must be amazing! 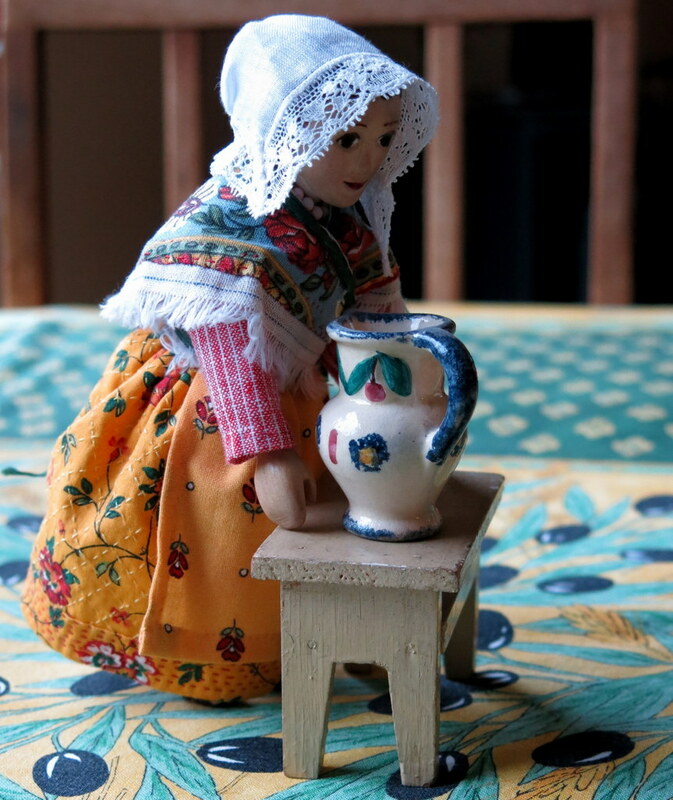 I think the collection is here in the Quimper Hittys blog! But it probably takes too long to look at it all…I do really enjoy making these clothes for the dolls and they enjoy wearing them. Thank you very much! Constance is very charmed that you think so! Your textile talents are amazing, adorable and useful. You continue to surprise me with the wonderful and endearing outfits you create. You also fill my life with the most wonderful stories. K, you are a complete and total treasure. I am very happy to sew for the Hittys, they never complain, even if it takes me eight years to figure out how to improve an article of clothing! Ahhhh, perfection! Constance is the very image of a Provencial Maiden. I agree that your addition of the quilting made it perfect!! now you need to make her that straw hat! I was very pleased that the additional layer did exactly as I hoped, and the look is very much what I hoped…the straw hat will be coming! Beautiful outfit! I am sure she is getting envious looks from the other Hittys! Thanks very much – I guess I’ll have to make the rest of them new/refurbished outfits too!